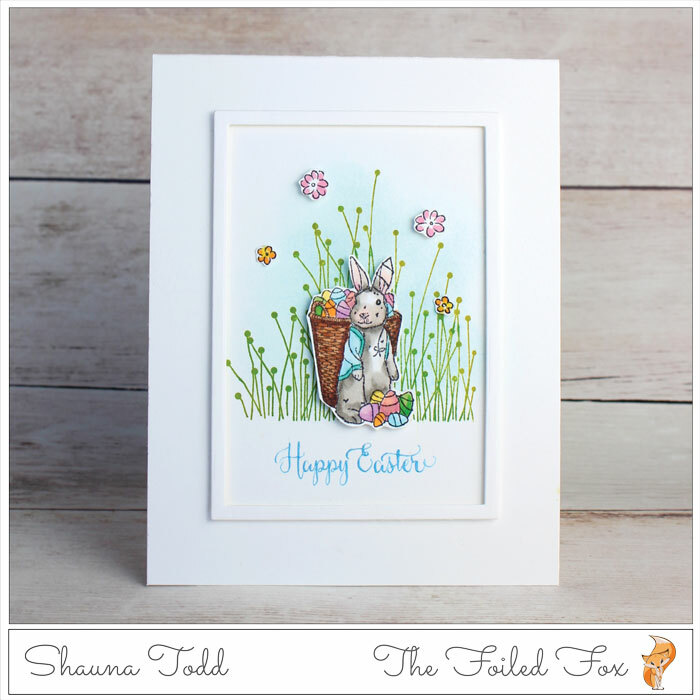 Today we are sharing a fabulous stamp set from Alexandra Renke, Bunny and Friends. 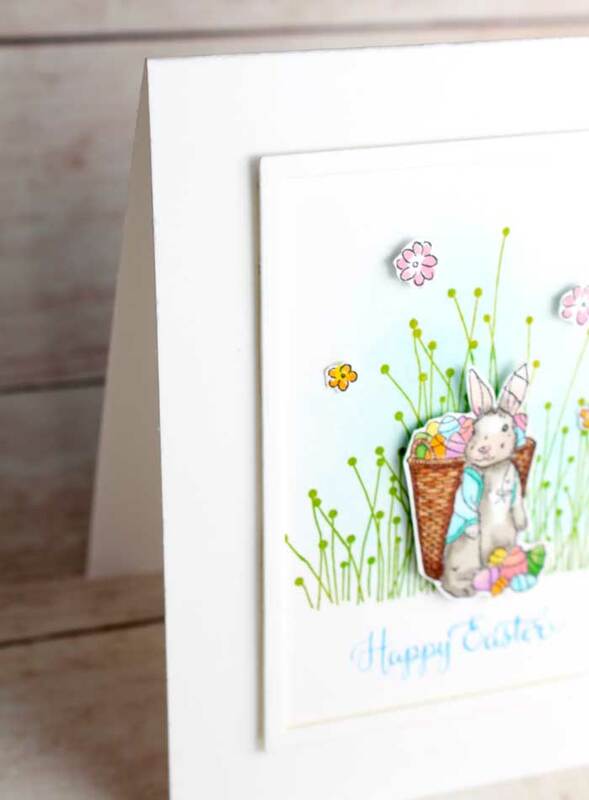 It has a collection of wonderful bunnies in different motifs… which means you will be seeing more bunny vignettes very soon! For this one, it is the traditional German or European rabbit with the handmade basket stuffed with Easter eggs – adorable! This card starts out with a Bristol card stock card base. I used Bristol paper because I knew I wanted to hand-letter the sentiment and it does not feather the words as Neenah card stock does. So, if you would prefer to stamp or stamp and heat emboss your sentiment, then Neenah card stock will work just fine. First, I blended a wide circle (or maybe oval) using Tumbled Glass distress ink on the front of the panel, then stamped the new Alexandra Renke Berries Reed stamp on top, using Mowed Lawn and Crushed Olive distress inks. I used a stamping platform to do this so I could first stamp with Crushed Olive, then Moved Lawn, then stamp Crushed Olive again in spots to give it a variegated look. 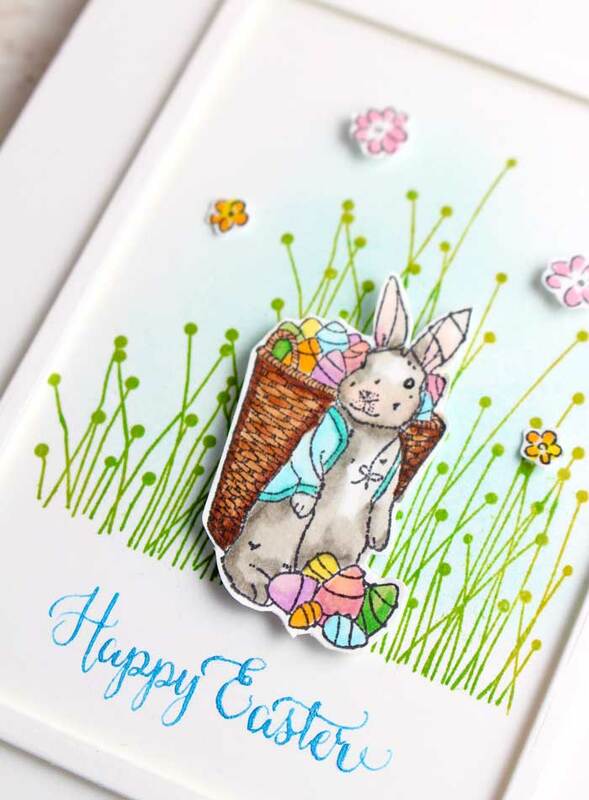 When finished, I fussy-cut the bunny with the basket, added foam tape to the back, then set it aside while I hand-lettered ‘Happy Easter’ using Dr. Ph. Martin Sequin Blue Iridescent calligraphy ink and a dip pen (see the supply list below for the specifics). Of course, as always, you can stamp or stamp and heat emboss your sentiment – I just like to letter sometimes. 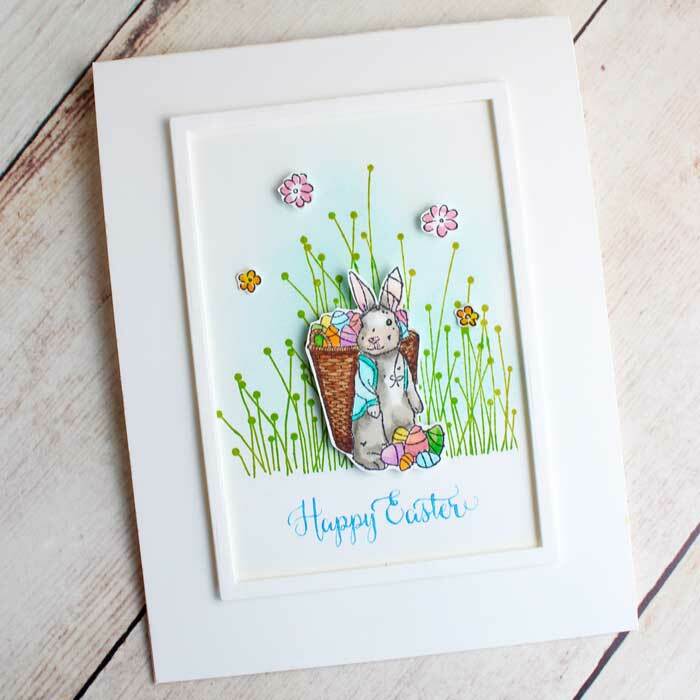 Now, I was ready to attach the bunny and add a small frame from the new My Favorite Things A2 Rectangle Frames die-namics. By the way, this set usually cuts a slightly wider frame but I often don’t cut the dies apart when I first get a frame set. I often cut the frames when they are still one piece (like they come in the package) a few times to have them to use for projects before cutting the dies apart. When you do this, it not only cuts the frames intended but you get an extra bonus by getting narrower ones that are in-between. I used one of the narrower ones, added foam tape and pressed it in place. As always, I can’t leave well enough alone, so I stamped tiny flowers from the Altenew Ditsy Print stamp set, colored them with Copic markers and fussy-cut a few out. Then, added a bit of foam tape to the back of the larger ones and glue dots to the back of the teeny-tiny ones. What a beautiful card. Those colors just scream spring! OH SO DELIGHTFUL!! Love the non-traditional bunny with baskets peeking out from the reeds and berries is so authentic. Well Done Shauna. Thank you. Hi there, We are the Foiled Fox girls, Ruri, Amber and Shauna. We love papercrafting with a touch of calligraphy. We will be sharing our exploits in the world of fun papercraft.